NRA’s Wayne LaPierre is, by all accounts a larger than life figure…well, at least that is what his PR bio says, it must be true. After all, there would be no reason for the face of the NRA to be intentionally deceitful. Yet, time and time again that is just what we see from Wayne LaPierre…lies, distortions, deceit, obfuscation, and contradiction. But maybe it is just the inability to think or act under pressure that makes Mr. LaPierre such a symbol of ethics-free behavior. Yesterday he had an opportunity to set things straight, to come clearly prepared to take on the US Senate and lay out his case. The opportunity slipped through his trigger fingers. He was, yet again left looking like a heavyweight fighter, well past his prime, with his opponents knowing his every move, riding the ropes. He could hear the theme from Rocky playing in his own head…but he couldn’t land the punches. Yesterday started well enough. He got up, dressed, met his bodyguards and headed to the Capitol. Now, you might ask yourself why, after making a big deal about President Obama sending his children to school with Secret Service protection that he – a man who in rhetoric and principle says that a person should be able to stand on his own – would have guards to protect him. He whines about New York Mayor Bloomberg having guards…does he somehow feel he is more important? Under more threat? It is a contradiction of character. As soon as Mr. LaPierre got to the Capitol the disintegration of his planned bullying began to fall apart. First, his bodyguards came off the Senate elevator and began pushing journalists aside, body-checking them and pushing them against the wall. It was then that Mr. LaPierre had the opportunity to understood two things clearly. His 2nd Amendment does not trump the 1st Amendment…the journalists are there for a reason, to get everyone’s side of the story on record. Second, he learned that, in the US Capitol he has to play by congressional procedures…their house, their rules. And that meant no bullying by Team NRA. When Mr. LaPierre got into the Senate hearing he got his first of many surprises. 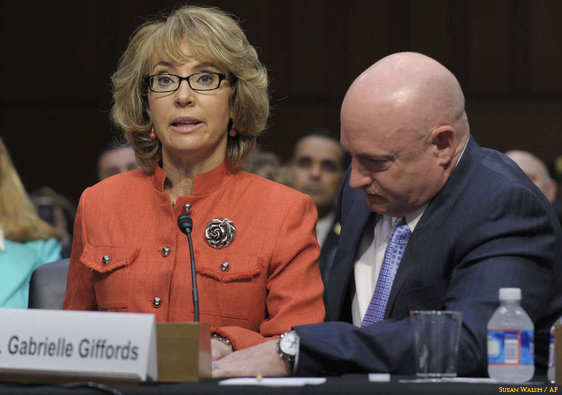 With the first speakers he would be on the defensive, the all important fight for image as Gabby Giffords made the first statement…a simple 10 sentence statement – 63 words. Then her husband, Astronaut and Navy Captain Mark Kelly began. His statement was powerful but, the body shot to Mr. LaPierre came when Captain Kelly interrupted his own statement to announce to those in attendance that yet another workplace shooting was occurring in Phoenix as they spoke. After these two opening shots, and a couple of more speakers it was Wayne LaPierre’s turn. He began with lies, contradictions, and obfuscation in his prepared remarks which were covered by Addicting Info earlier. A stammering Wayne LaPierre tried to return fire…“So those – the 62, senator, statistic, was for Chicago alone.” He had, as folks who know guns would say – a failure to fire. 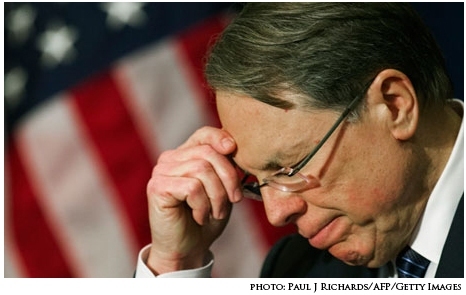 “We do not” said Mr. LaPierre in direct contradiction of previous NRA positions. Mr. LaPierre didn’t miss the point, he chose to obfuscate it with illogical rhetoric. He then left the Senate hearing with his retinue, his bodyguards. Maybe his day will get better as he faced Life Members who had paid $1,000 for a Life Membership and those memberships are now offered for $300 or a free one year membership. They have to jack up their membership numbers someway. This entry was posted on Friday, February 1st, 2013 at 3:42 am	and tagged with 2nd Amendment, AR-15, AWB, firearms, Gabby Giffords, GOA, gun, gun control, gun culture, gun owners, gun violence, homicide, Mark Kelly, murder, NRA, Second Amendment, Senate Hearing, Wayne LaPierre and posted in Politics of Guns. You can follow any responses to this entry through the RSS 2.0 feed.